Jew's are reputed to have been amongst the "Mountain Men" accompanying famed explorer Jim Bridger in the early 19th century. Julius and Fanny Brooks were the first documentable Jewish Americans, 1855, who made Utah their home. A chance meeting with a U.S. Army Captain in Galena, Ohio recommended they move west for opportunities. The Captain was Ulysses S. Grant, later president of the United States. 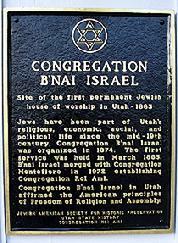 It was not until 1874 that the Jewish community in Salt Lake City grew large enough to establish a regular, sustainable Jewish religious community. The plaque is located at the historic Peery Hotel. 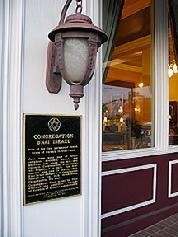 The Peery was built in 1910 on the site of the earlier Congregation B'Nai Israel. The Congregation had relocated to 249 South 400 East Streets in Salt Lake City in 1889. The new house of worship was a scaled reproduction of the "Great Synagogue" in Berlin, Germany.